Aleksandr Grigorenko has spent practically his whole life in the depths of Siberia. He lives near Krasnoyarsk working as a journalist. 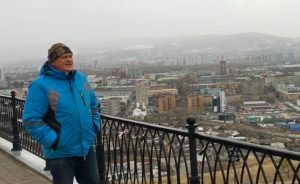 Today he gave me a tour in and around Krasnoyarsk – with lots of stories behind it. In both his novels MEBET and ILGET the author is asking the old questions about existence, happiness and the loneliness of man. His modern magical realism with versatile heroes who challenge their destiny, are based on the rituals of the Nenets and Evenks people of the far north of Krasnoyarsk region, and the mystical beliefs which shape their daily lives. 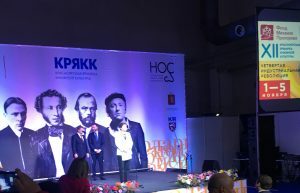 For the first time – finally – I visited the famous KRYAKK (Krasnoyarskaya Yarmarka Kniznoi Kultury) where I took this photo on the official opening. This book fair was initiated and is mainly sponsored by the Prokhorov foundation, so it was of course Irina Prokhorova welcoming all guests. 5 days full of interesting events, discussions, readings for an enthusiastic Siberian audience.